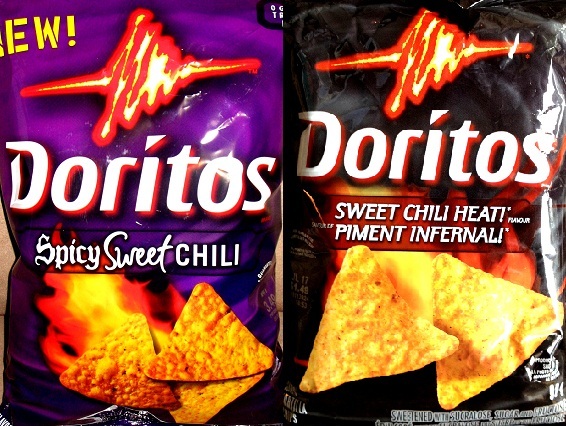 REVIEW: Doritos – Spicy Sweet Chili & Sweet Chili Heat! Both bags of chips have that same mixture of Asian flavors – loads of soy sauce, some chili heat, a little vinegar-y zing, and a touch of sweetness. The combination instantly reminds us of eating spicy sweet and sour foods, aka, American Chinese buffet food. We said before here, and we’ll say it again, Chip Review truly feels that this flavor combination compliments potato chips much better than it does corn tortilla chips. As always we would love to hear what you think. Let us know. ← Stay Tuned Chip Fans…. Hey Gas Station, we will definitely give these a shot. Thanks for the link! Absolutely love these chips. When I first tasted them back home in Winnipeg, they became my go to comfort snack. To go ALL OUT, my brother and I dipped them in Tostitos cheese salsa dip. Maximum flavour and awesomeness. Bold BBQ Doritos were a close second. Now I live in Texas, and these chips are hard to come by. I tell ya, Canada just snacks better than ‘merica. @dueckrandy – thanks for the comments! We always love hearing the thoughts and opinions of other chip lovers! Hi Albert. I also love chips. I also enjoy partaking in chip snacking. I also enjoy a chip every now and then. I too enjoy a good bag of chips.